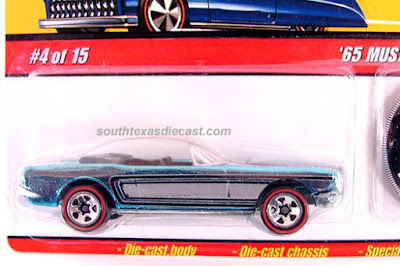 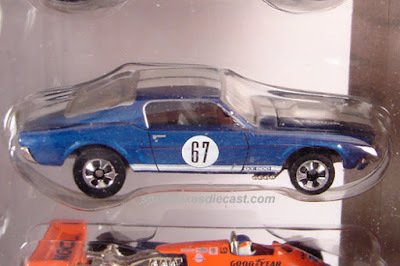 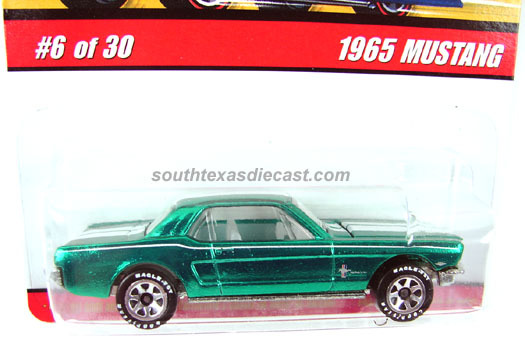 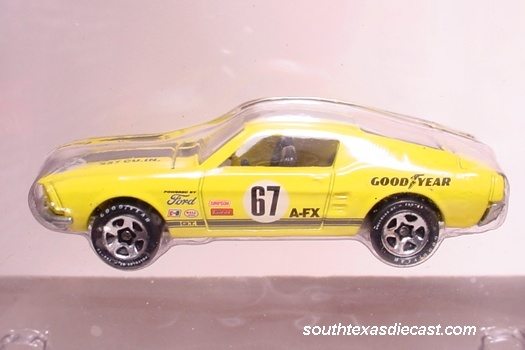 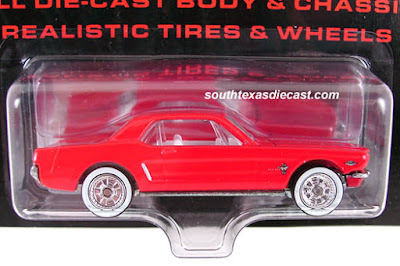 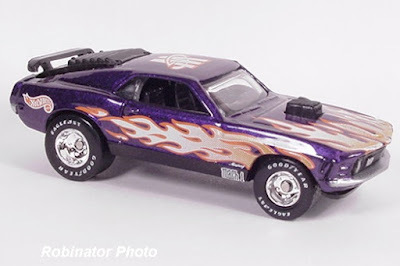 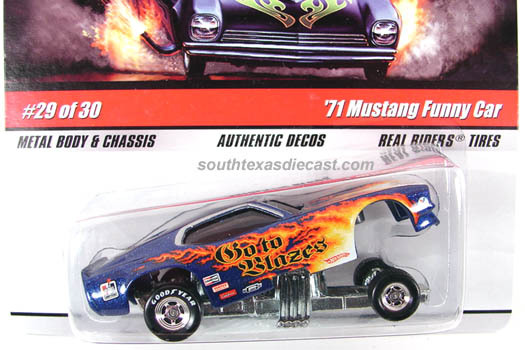 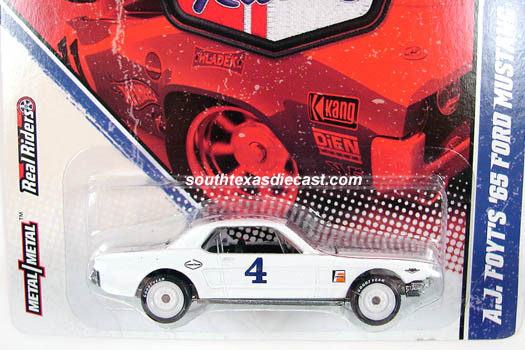 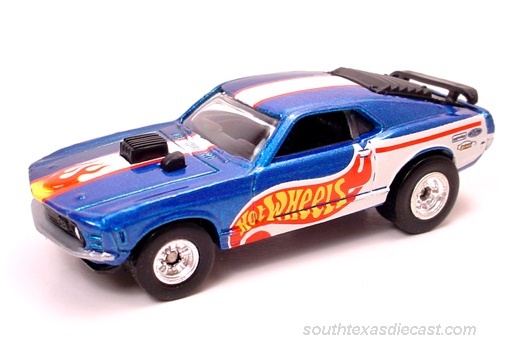 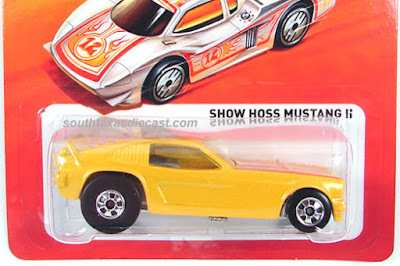 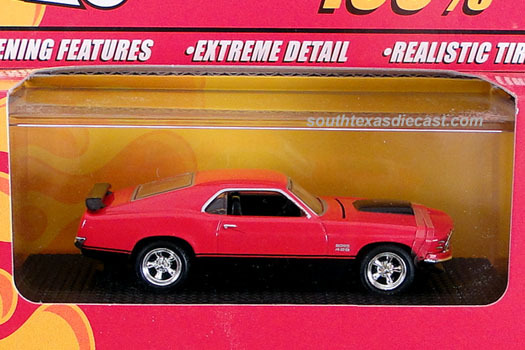 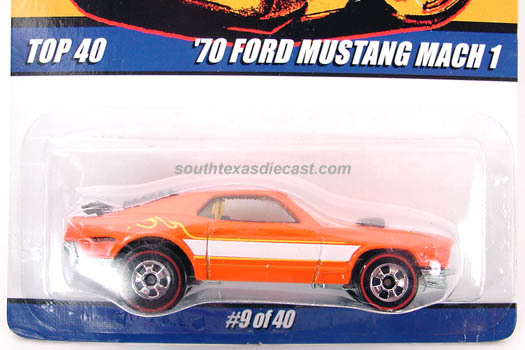 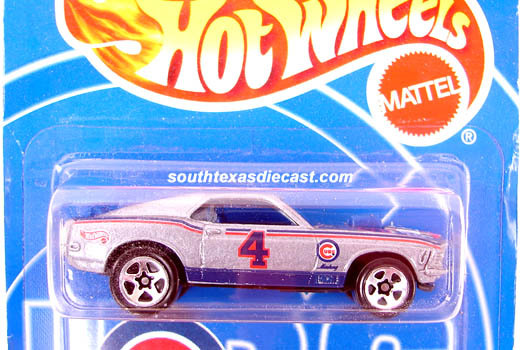 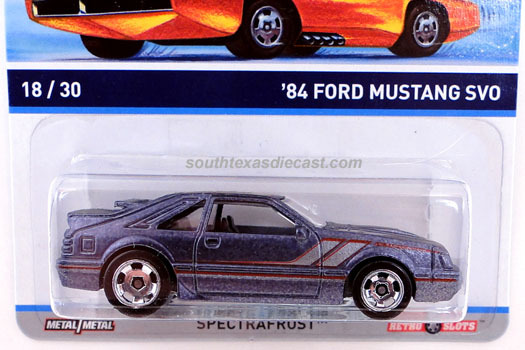 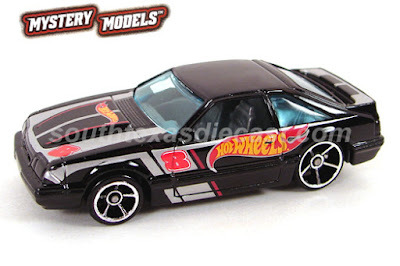 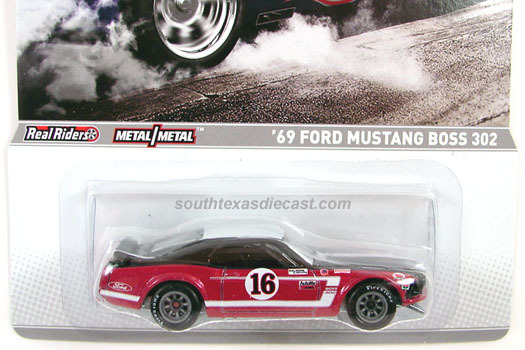 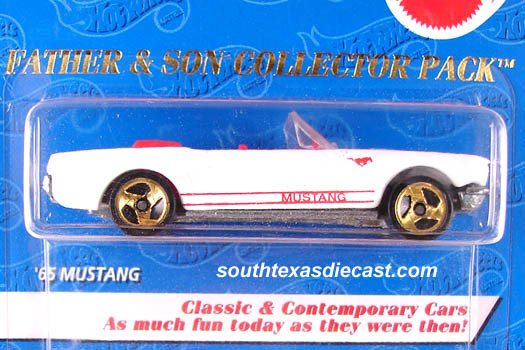 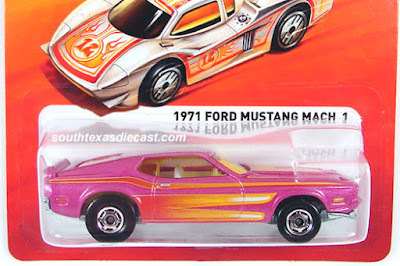 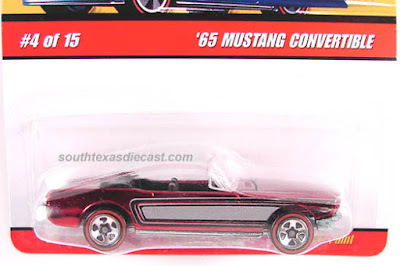 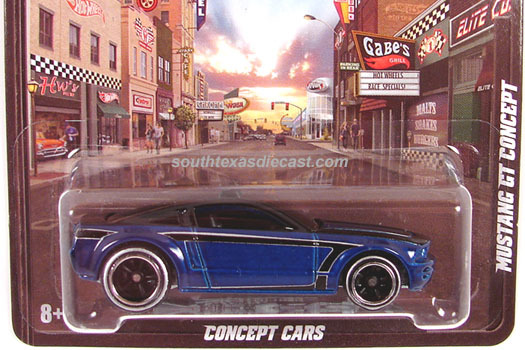 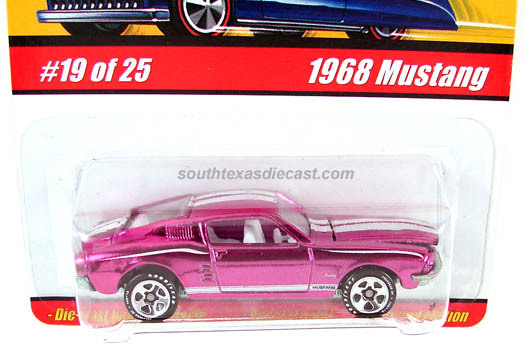 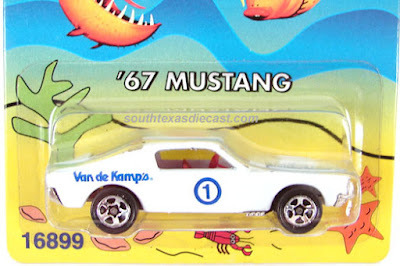 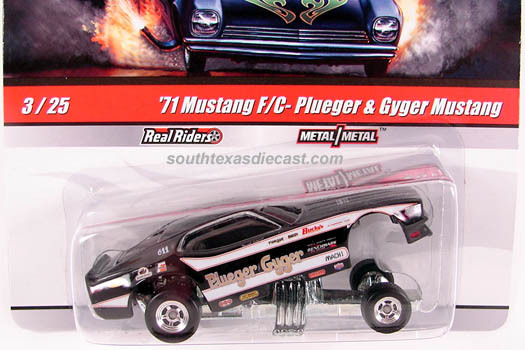 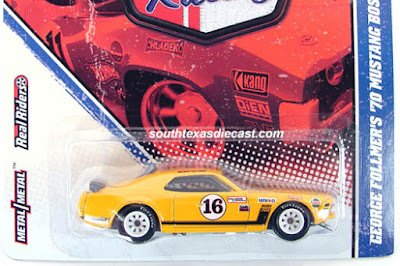 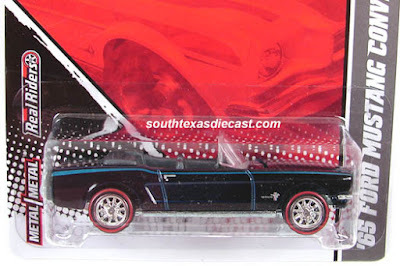 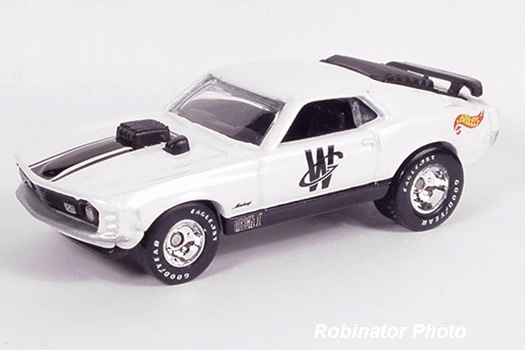 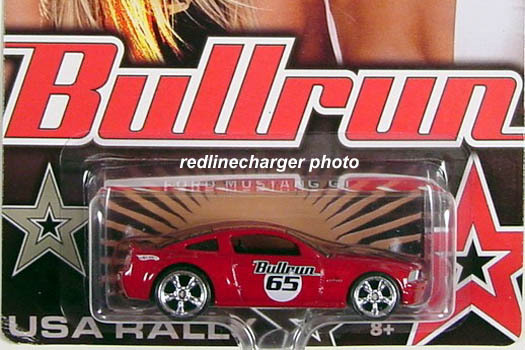 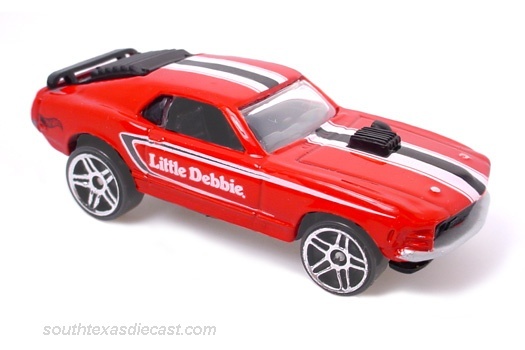 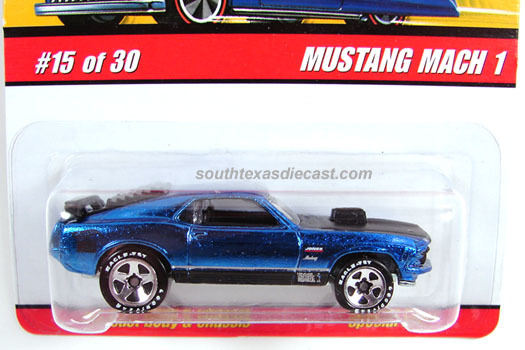 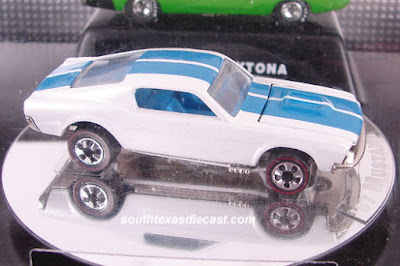 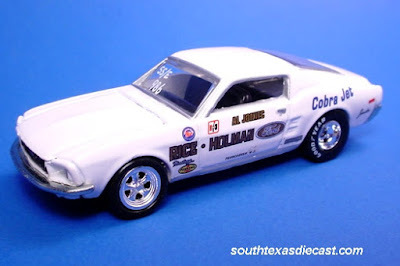 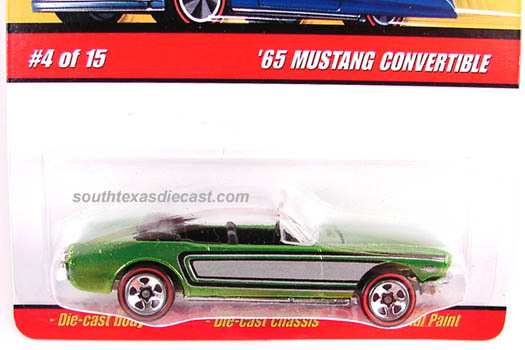 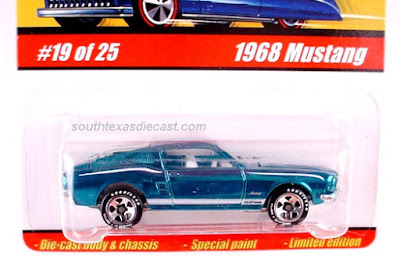 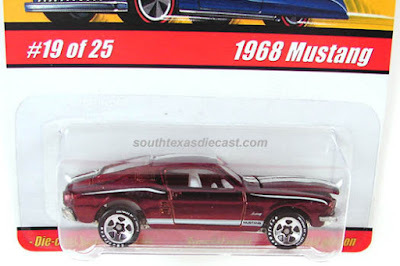 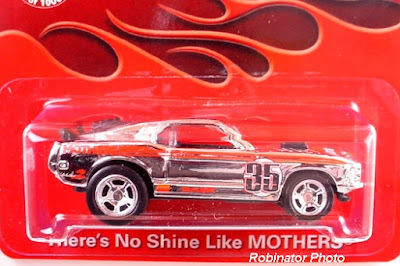 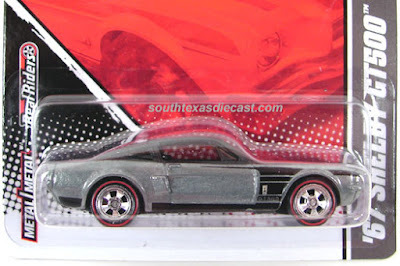 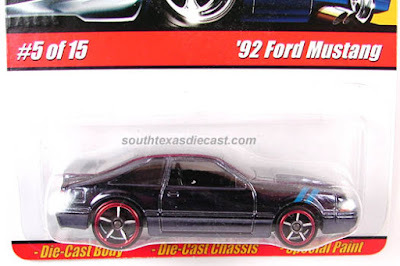 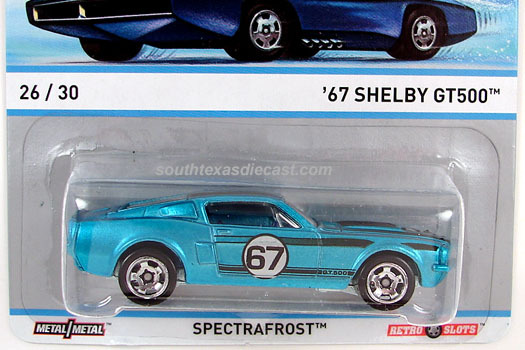 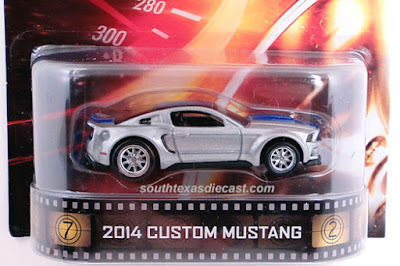 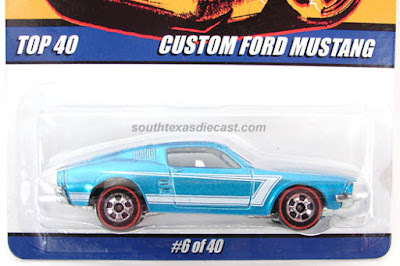 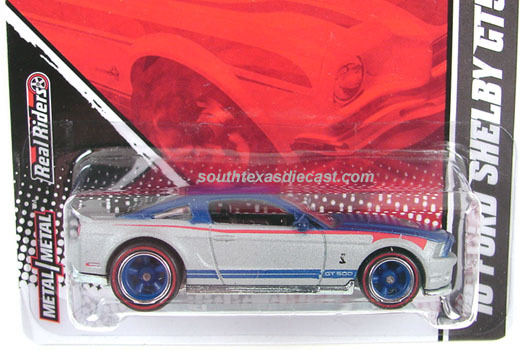 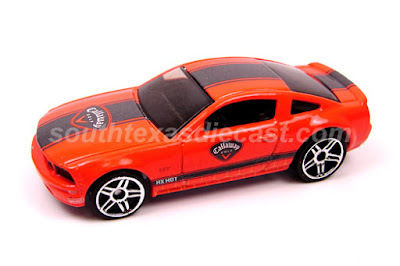 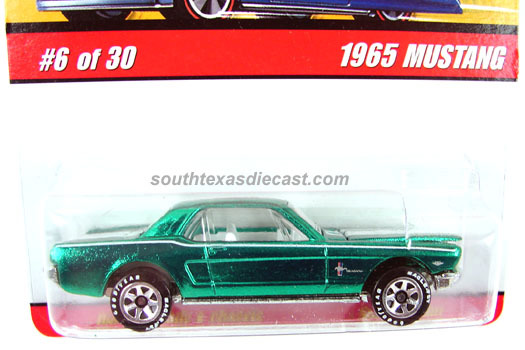 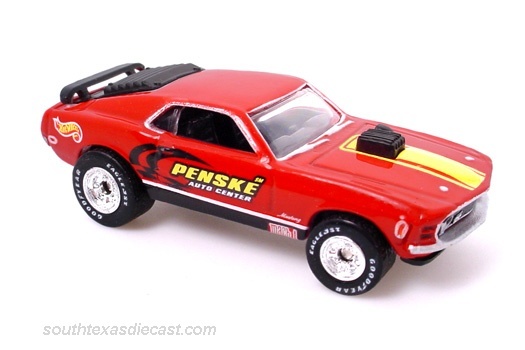 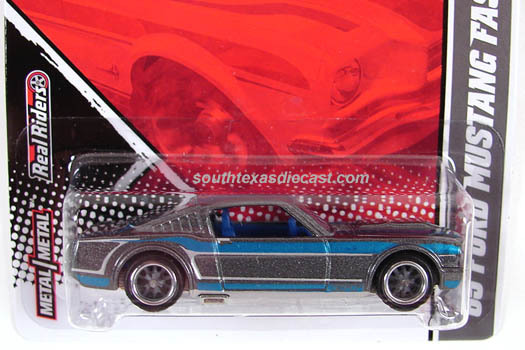 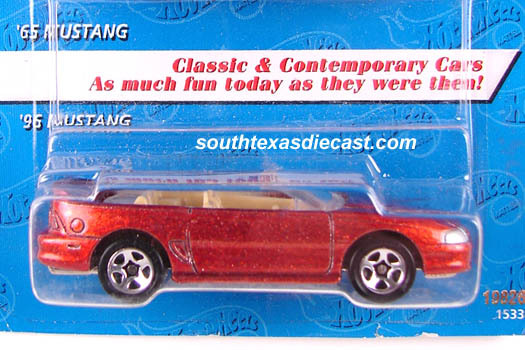 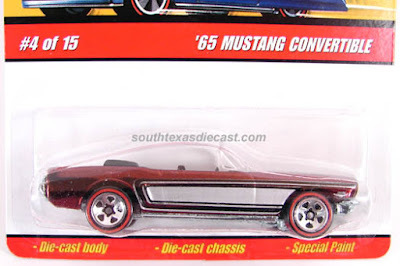 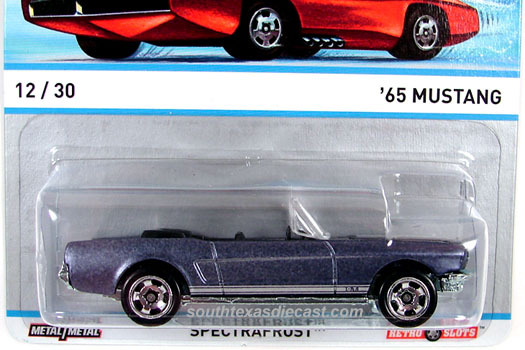 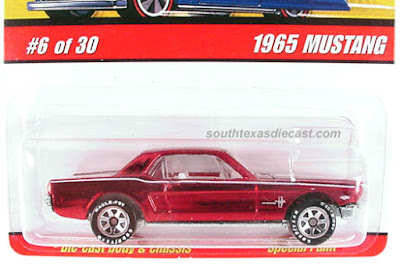 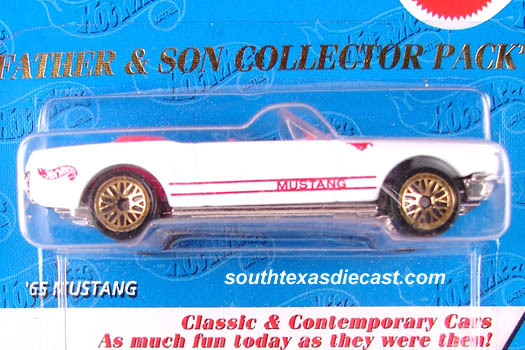 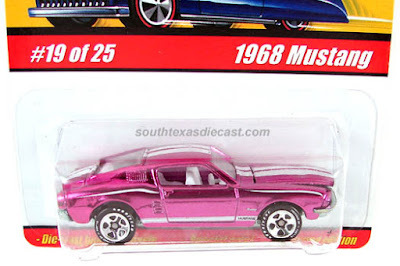 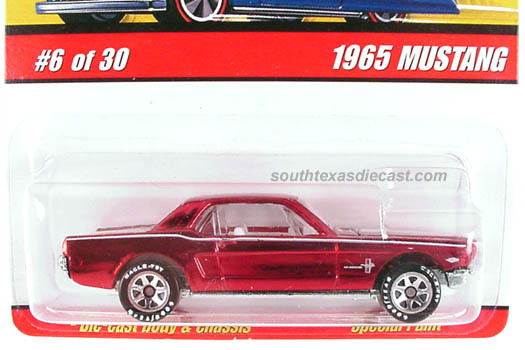 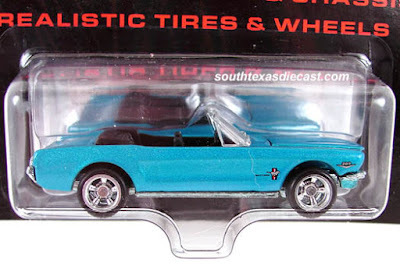 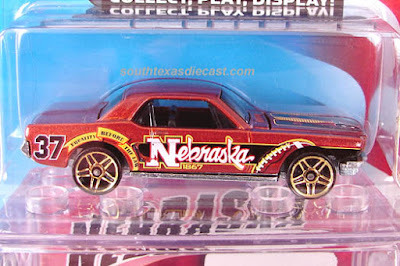 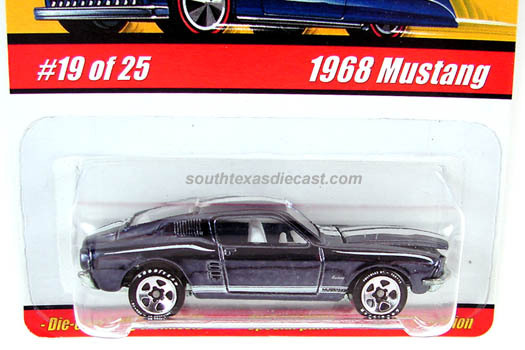 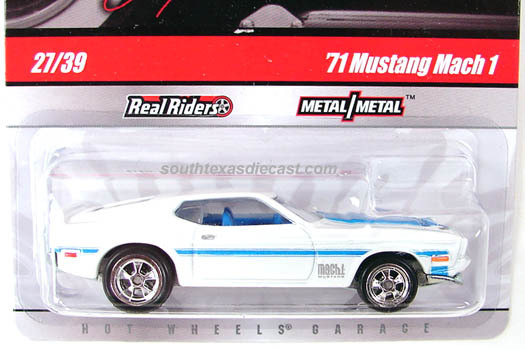 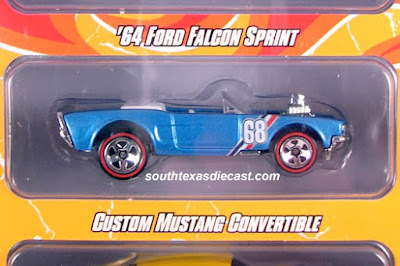 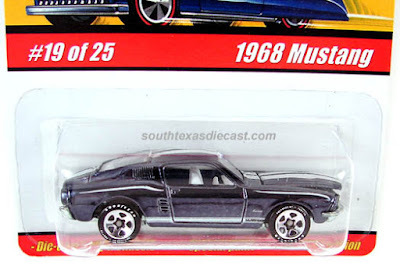 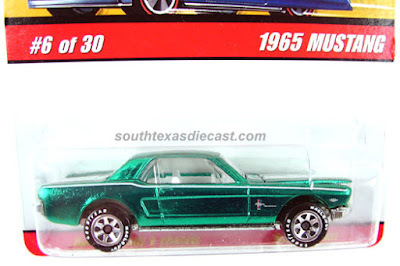 This page includes Mustangs in different series Hot Wheels have put out over the years. 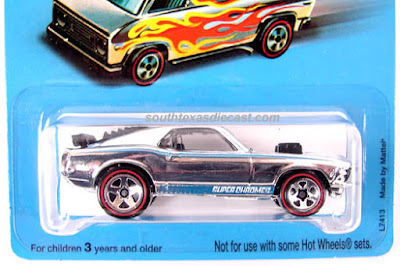 In 2010 Hot Wheels came out with the Hot Wheels Garage series. This series replaced the Larry's Garage after Larry Wood retired from Mattel. Wal-Mart sold a boxed set of this series that included several exclusives for the box set. 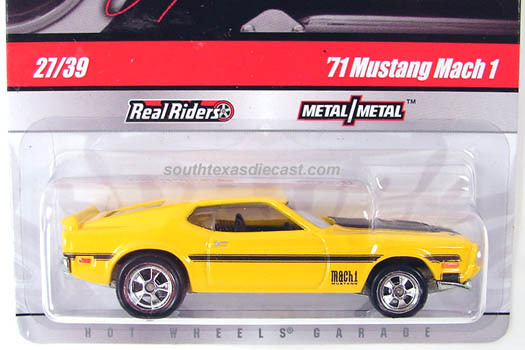 The cars in this series all sported Real Rider tires. Here are the Mustangs out of that series. 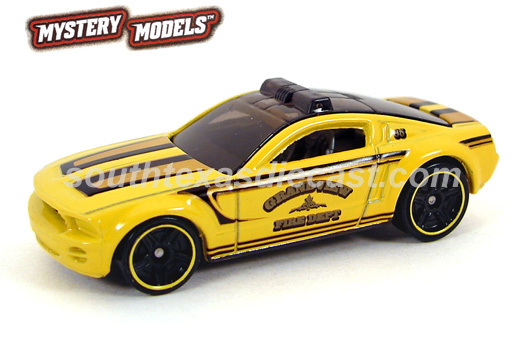 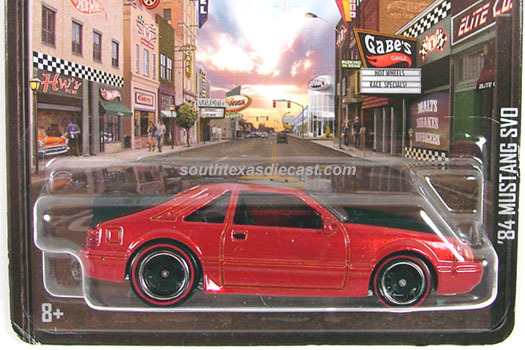 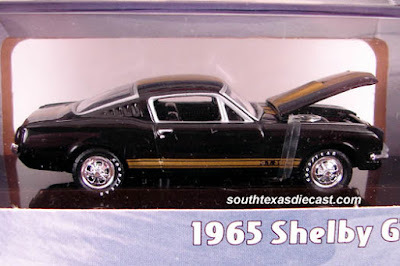 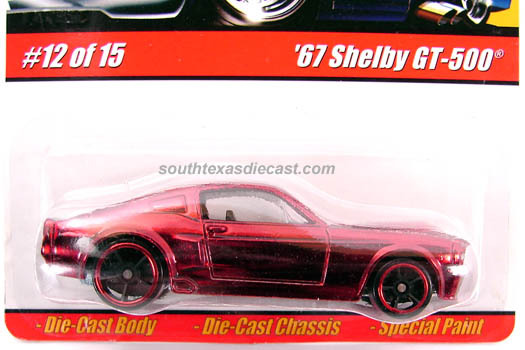 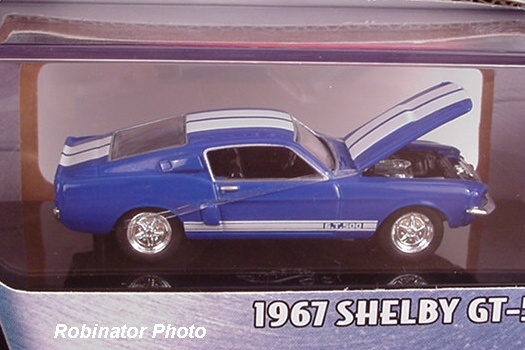 This Shelby was one of the exclusives included with the Garage series boxed set sold at Wal-Mart stores. 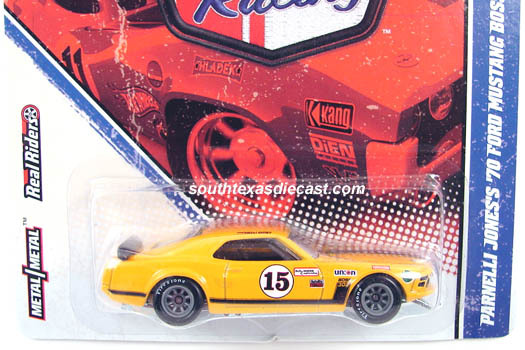 In 2008 Hot Wheels came out with Larry's Garage Series. 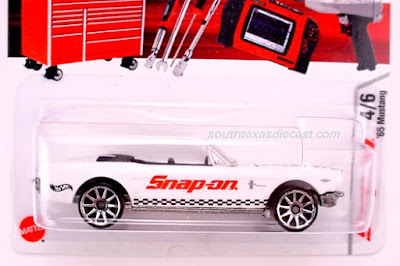 This series was dedicated to Larry Wood's garage of cars. Larry Wood was a Hot Wheels designer for Mattel for a long time. 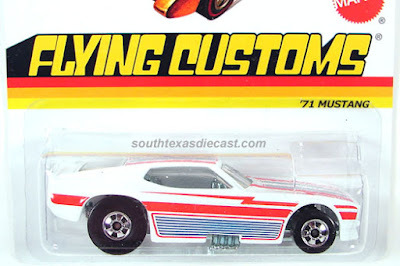 In this series he actually signed the bottom of some of these cars. 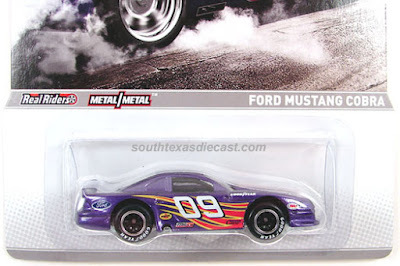 These cars are called the signature series and are becoming hard to find. In this series he did sign the '69 Mustang and it came in four different colors. These were also found at the retail level with no signatures on them. 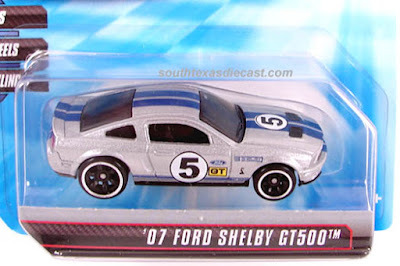 Toys' R Us did sell a box set of this series and it included a fifth color of each car that was also signed. 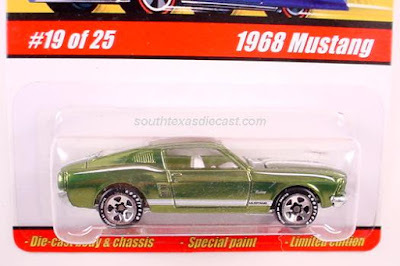 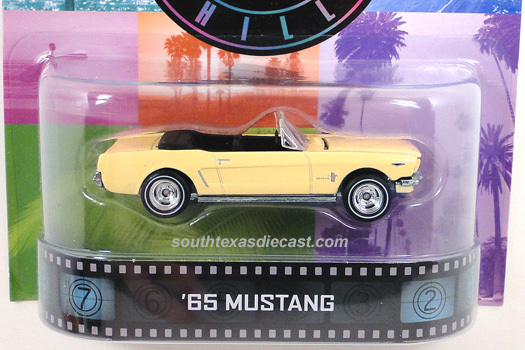 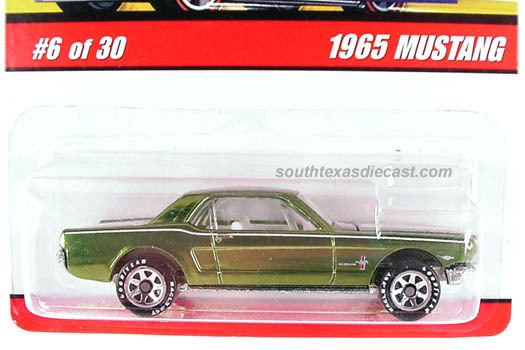 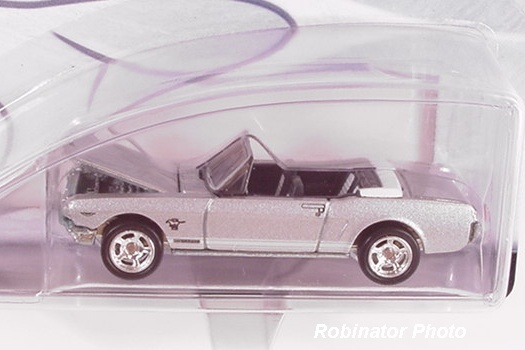 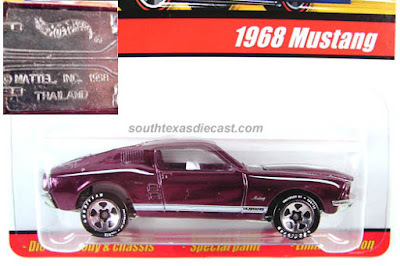 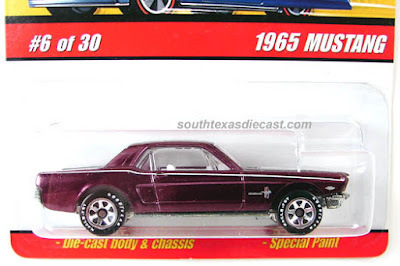 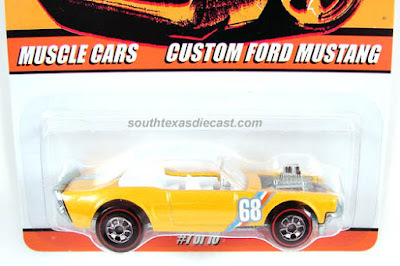 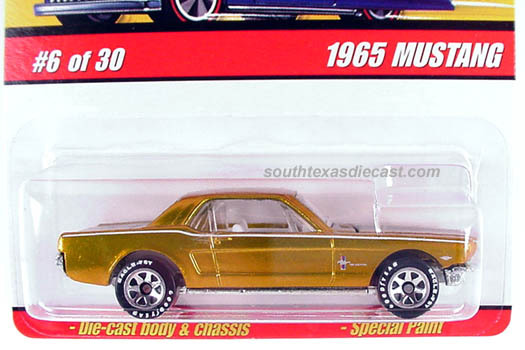 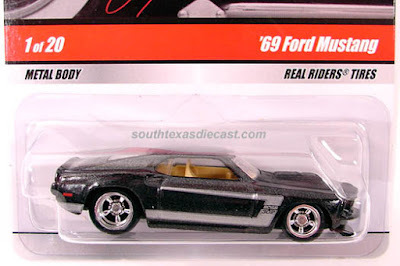 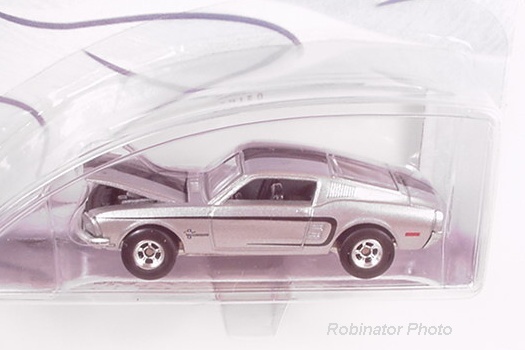 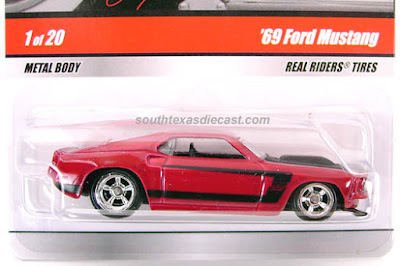 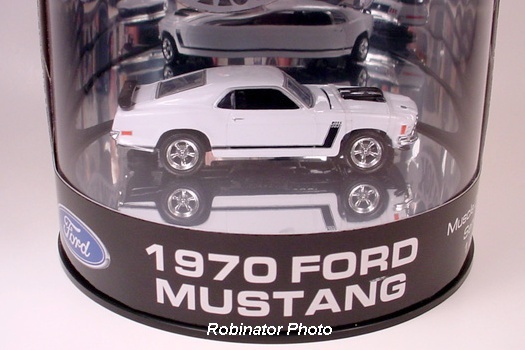 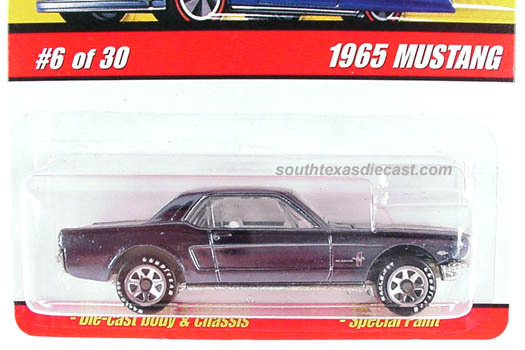 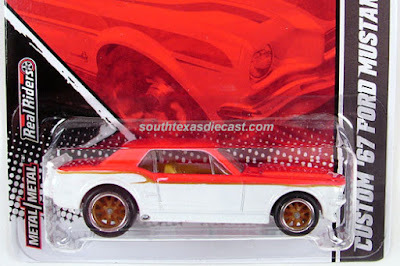 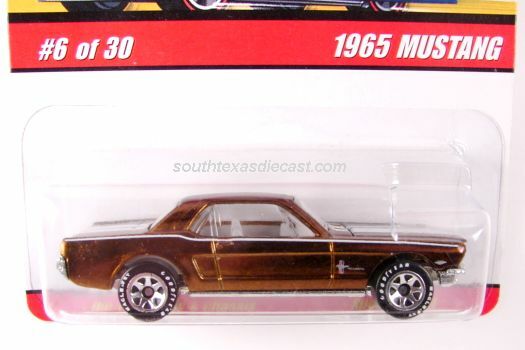 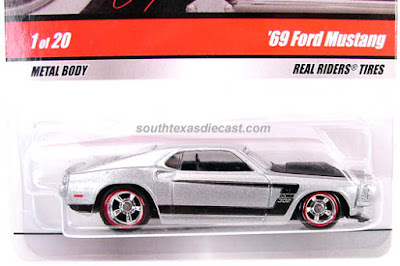 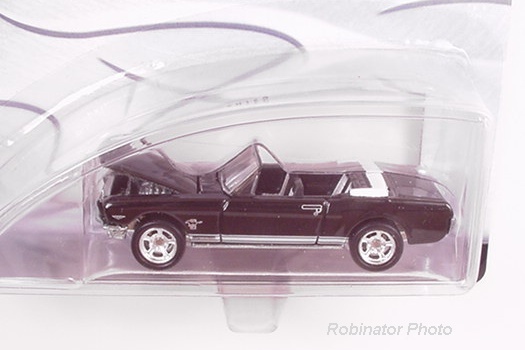 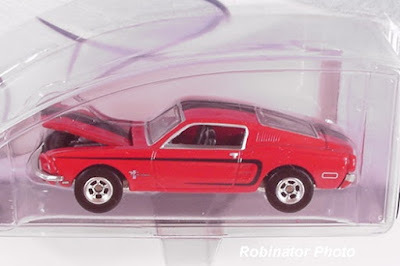 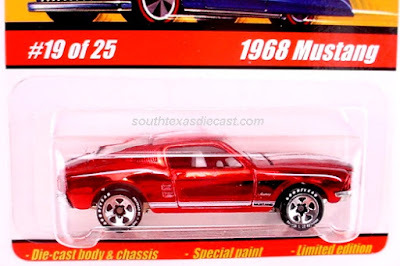 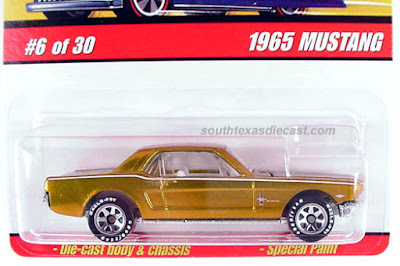 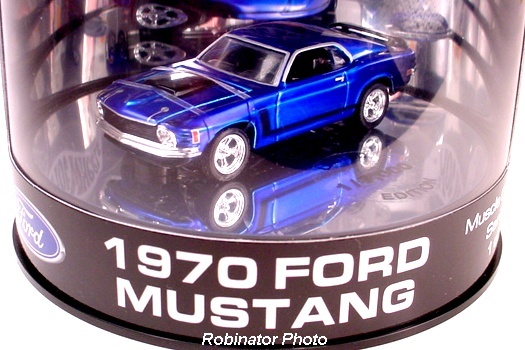 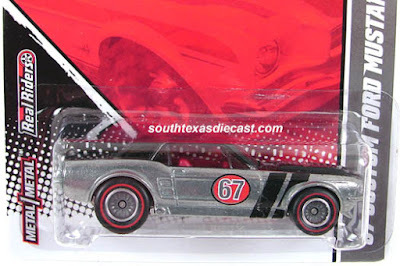 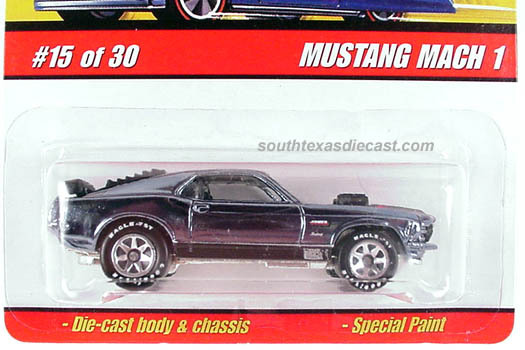 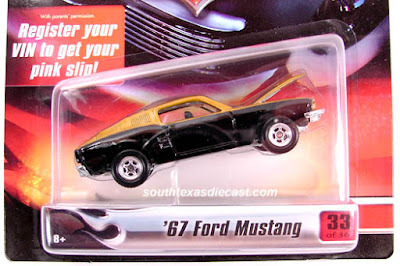 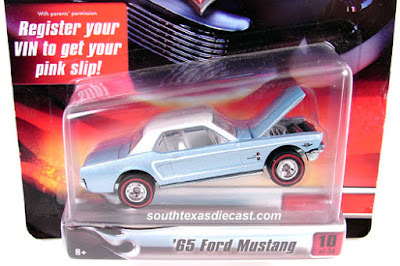 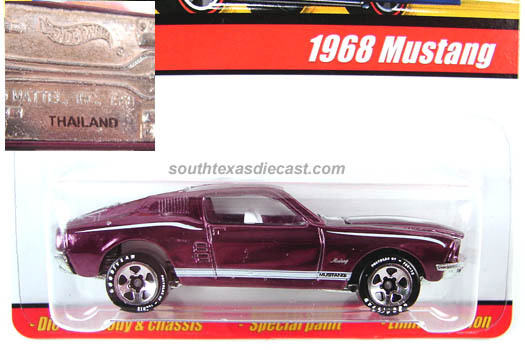 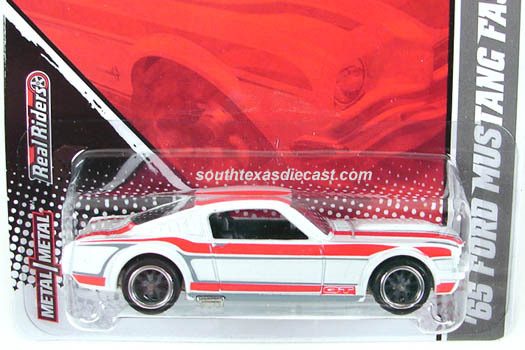 Here is the Toys' R Us boxed set exclusive '69 Mustang. 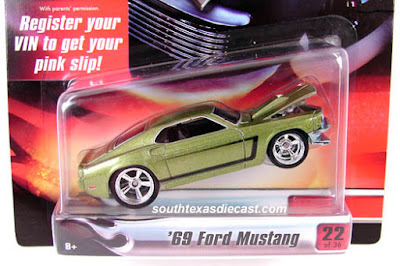 It is signed on the bottom of the car. 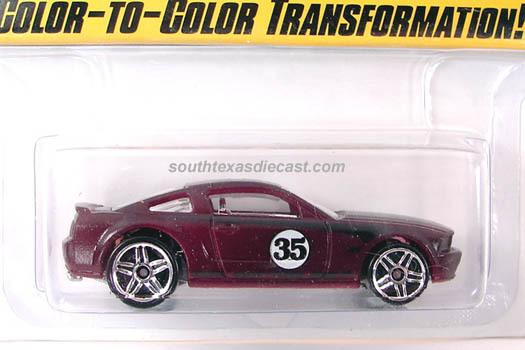 The Larry's Garage Series came back out in 2010 but this time each casting only got three colors. 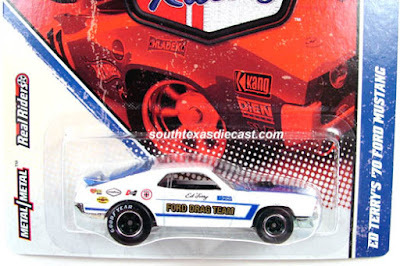 And again like the first run of the series, each car was found signed by Larry Wood. Also like the first run of the series, there was a boxed set that was sold but this time it was only found in Wal-Mart stores. Every box set exclusive was also signed. 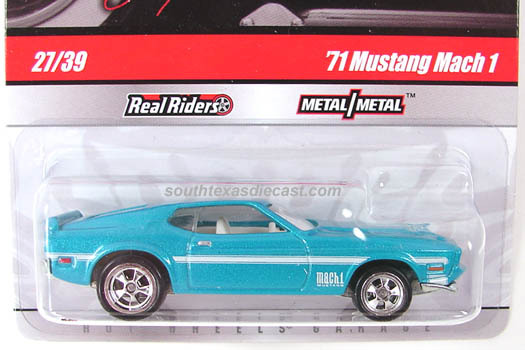 In the second run of the series, the '71 Mustang Mach 1 was included. 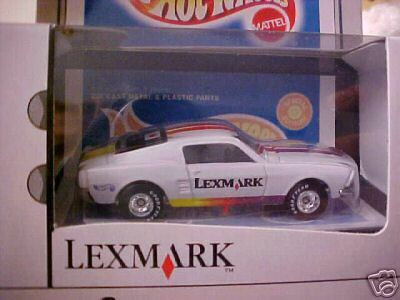 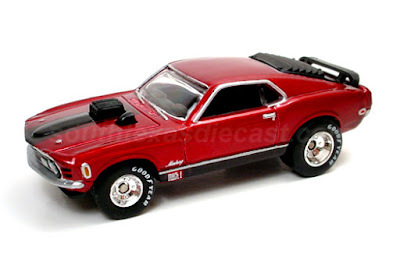 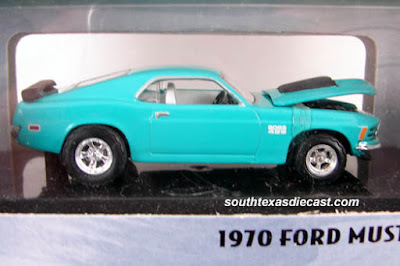 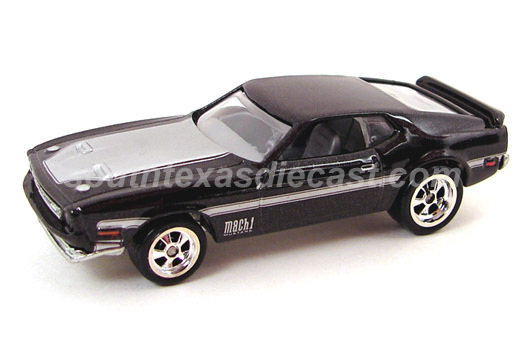 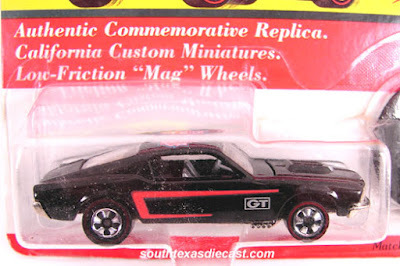 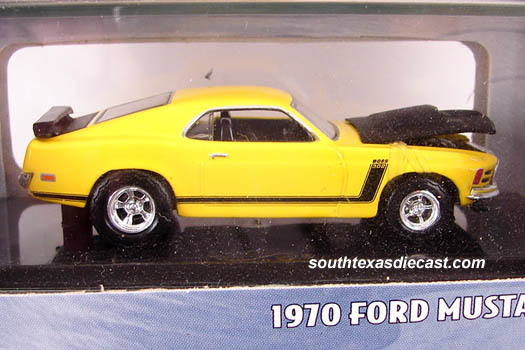 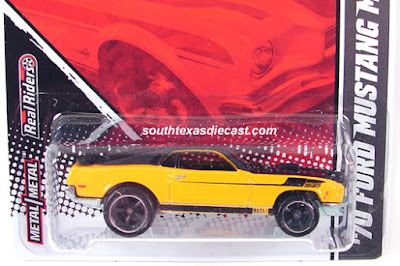 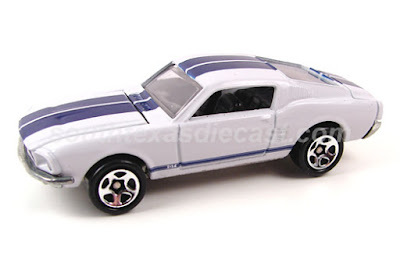 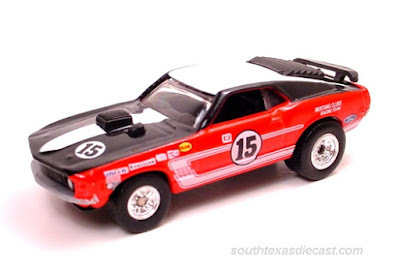 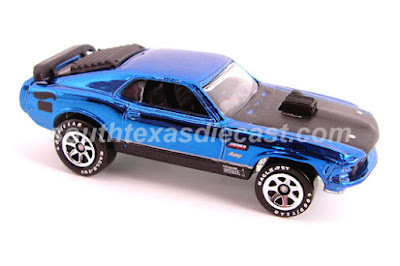 Here is the Wal-Mart boxed set exclusive '71Mustang Mach 1. 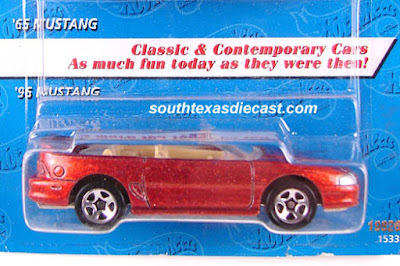 It is also signed on the bottom of the car. 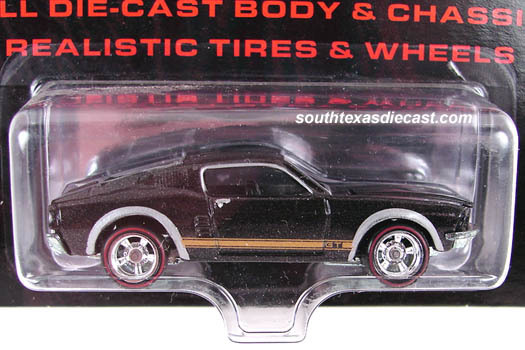 This Mustang was found with skinny rear wheels and wide rear wheels. 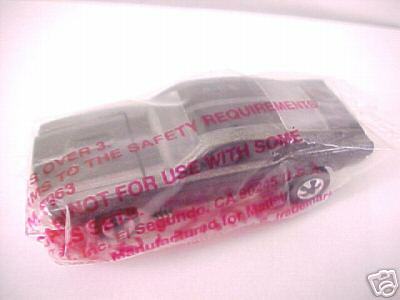 Hot Wheels came out with this series in 2005. 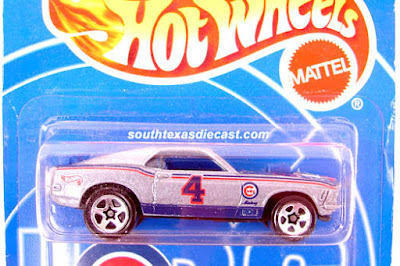 They put out Series 1 in 2005, Series 2 in 2006, Series 3 in 2007, Series 4 in 2008, and Series 5 in 2009. 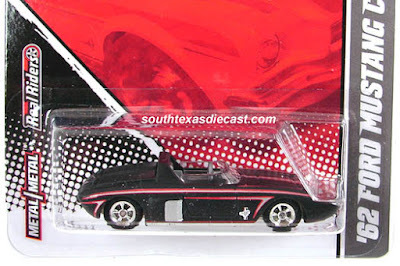 Each car was released in several different colors and had spectraflame paint and metal bases. Here are the Mustangs released in the series. 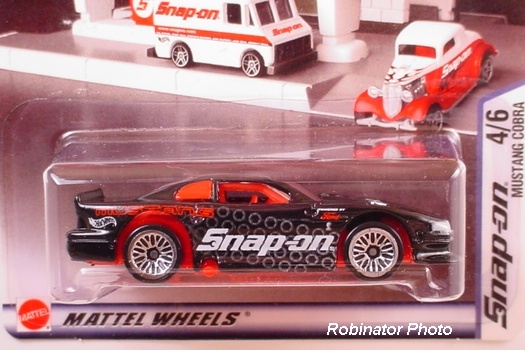 This one had a base variation where "Thailand" was engraved and printed on the base. This Mustang could be found with either a clear or white interior. 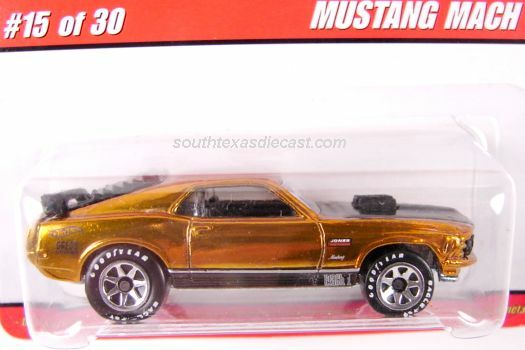 This Mustang was only available online. This Mustang was also found with Goodyear 5 spokes. 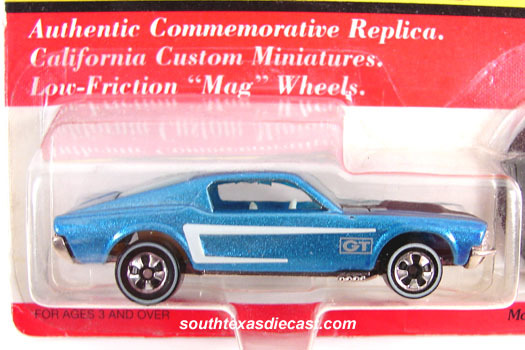 This Mustang has Goodyear 5 spokes. This Mustang was a set release only. It has Goodyear 7 spokes. 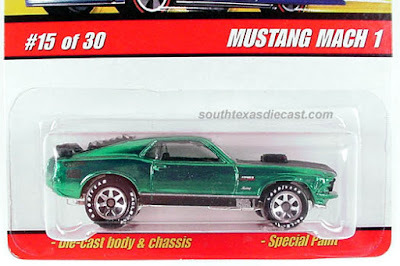 There were no Mustangs released in Series 3. There were no Mustangs released in Series 5. 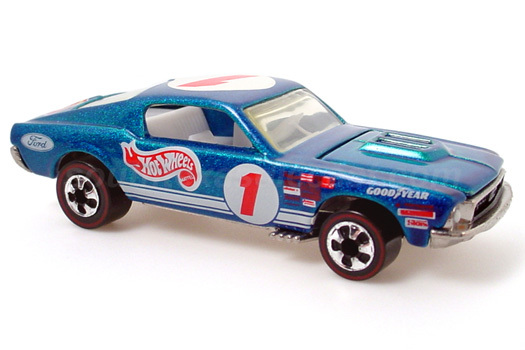 In 2013 Hot Wheels released a series called Cool Classics. 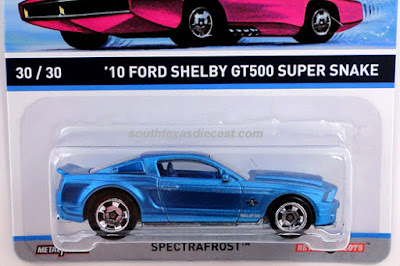 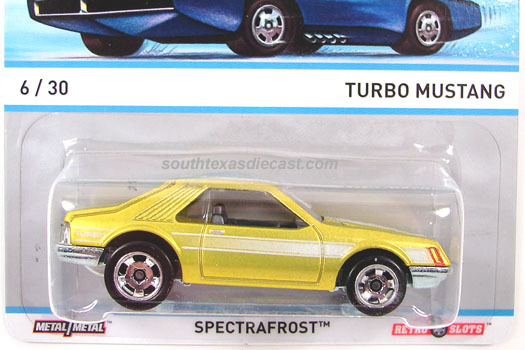 This series has a new paint process called Spectrafrost and also the series had retro slot wheels exclusive to the series. 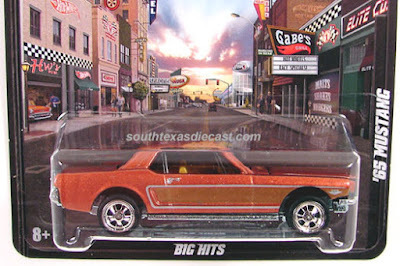 This series replace the Boulevard series. 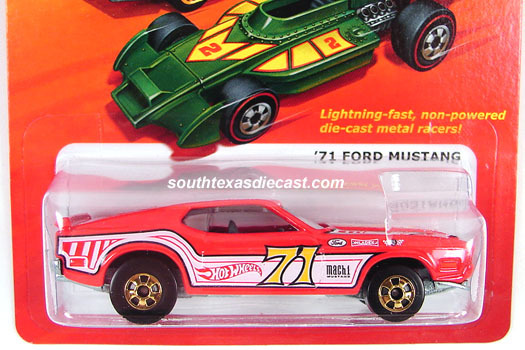 Here are the Mustangs that came out in this series. 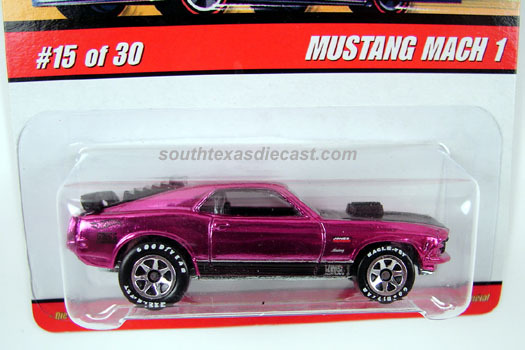 This Mustang received a new tooling on this casting. 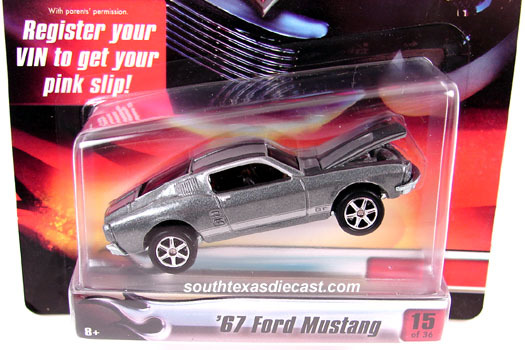 The spoiler became all metal and the louvers and interior became one piece instead of separate pieces. In 1994 Hot Wheels came out with a series to commemorate the very first Hot Wheels that came out in 1968. This series was called the Vintage Series. 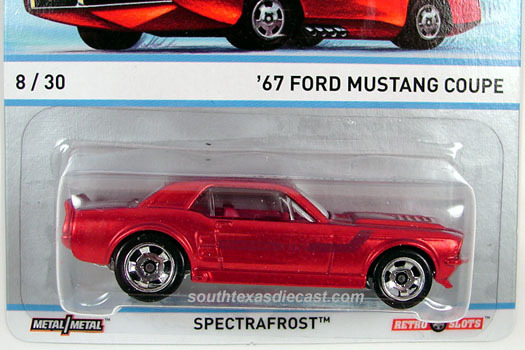 Each car that came out in the series was released in eight to ten different colors that they were originally released with in '68. 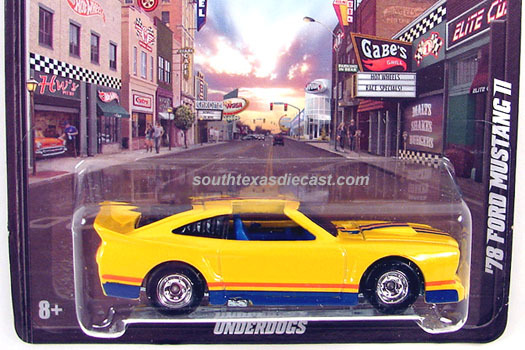 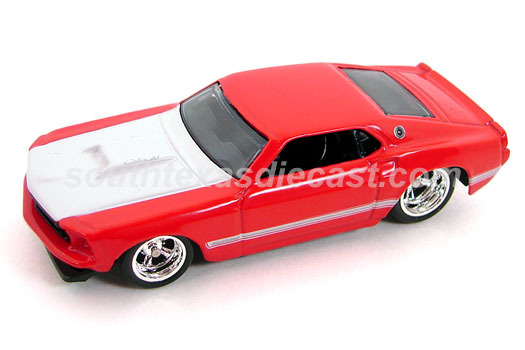 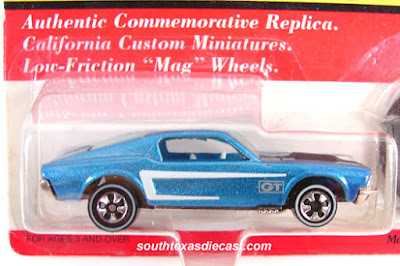 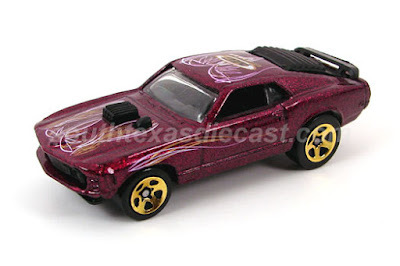 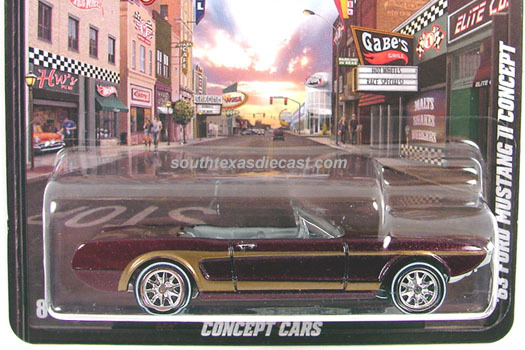 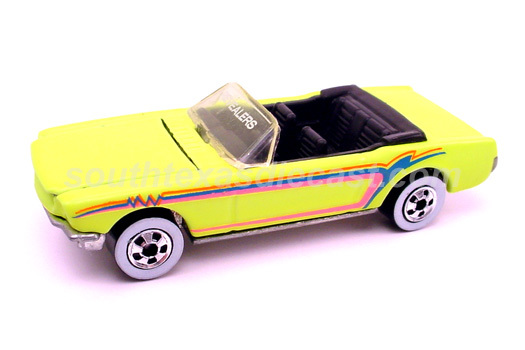 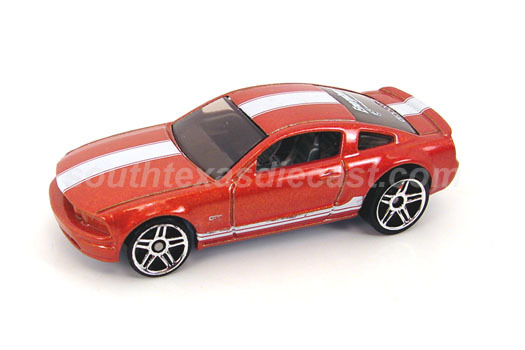 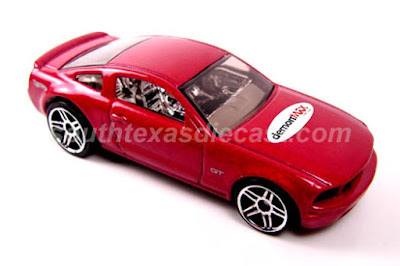 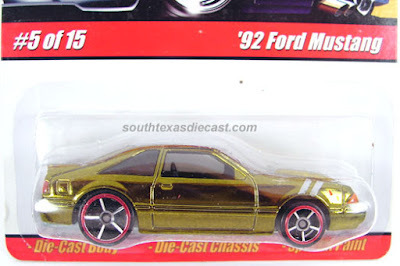 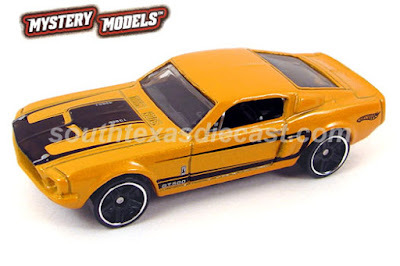 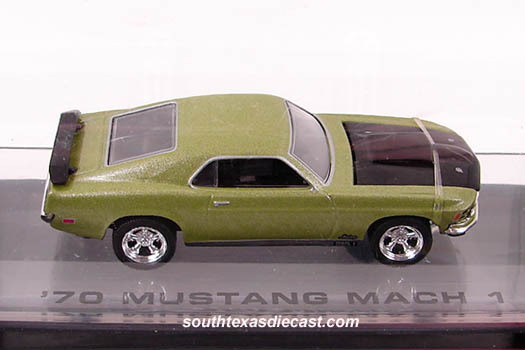 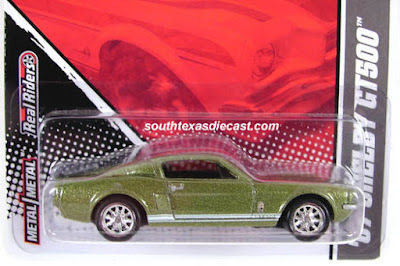 The custom Mustang was released in this series in 9 different colors. 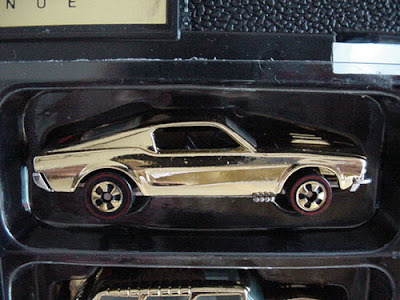 One color was released with the boxed set. This Mustang is hard to find! These are 2 Seattle Toy Show exclusives that are part of this series too. 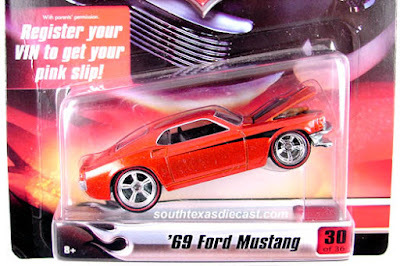 In 2008 Hot Wheels released this series called Modern Classics. All castings used in this series had chrome and spectraflame paint. 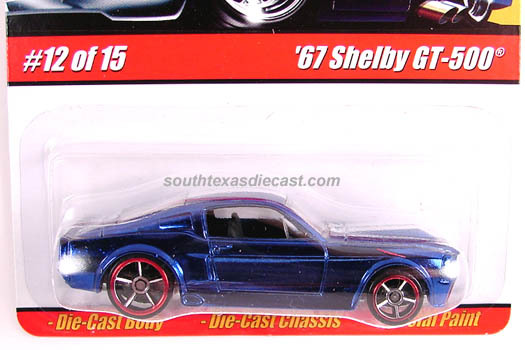 The '92 Mustang, '07 Mustang (Custom), and the '67 Shelby GT-500 (Eleanor) all were new releases. Here are the Mustangs that got released from this series. This color was very hard to find! 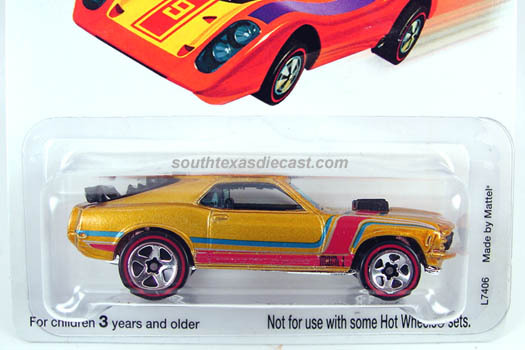 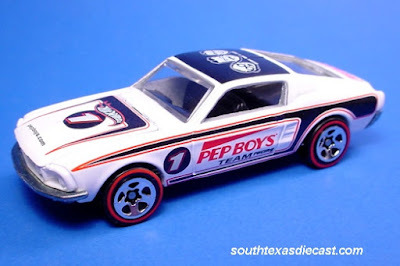 In 1981 Hot Wheels released a series called The Hot Ones. 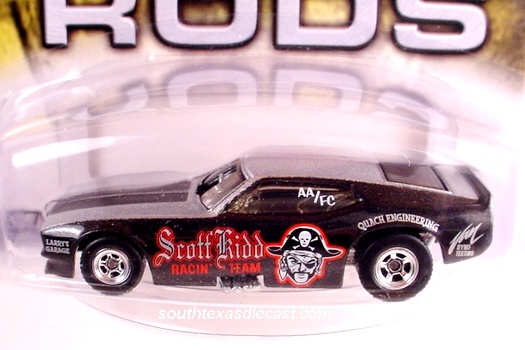 This series included a new axle design. 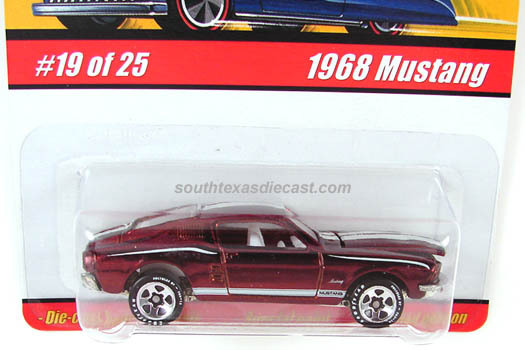 In this series there were some Mustangs released that will be pictured at a later date. In 2011 Hot Wheels brought back this series for a short run. 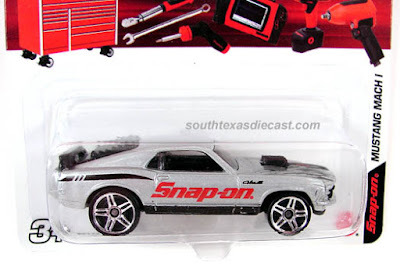 This time they included with it some chase cars. 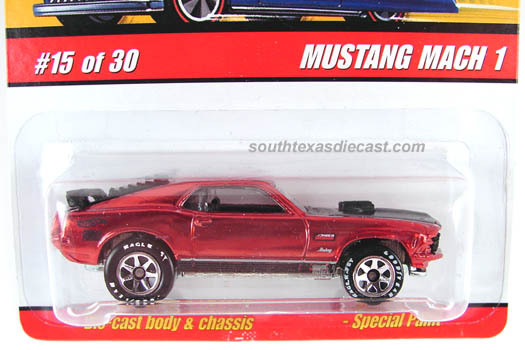 The red '71 Mustang Mach 1 and the '65 Mustang Convertible could both be found with red line tires. 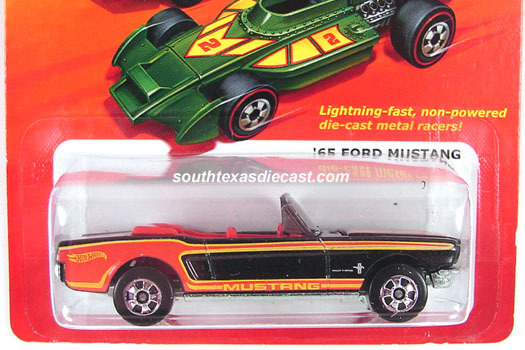 Here are the Mustangs that came in the second run of this series. 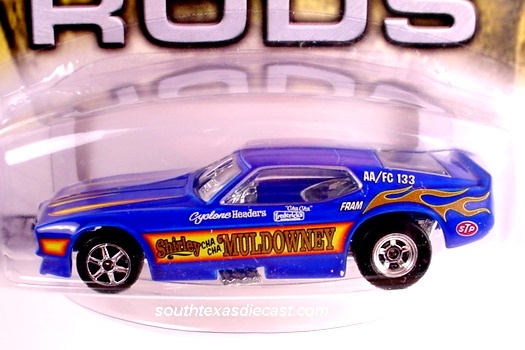 In 2013 Hot Wheels came out with the Boulevard series. This series replaced the Garage series which ended in 2011. 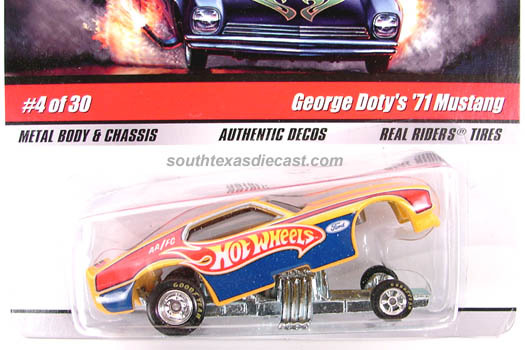 This series featured some very nice card art and all cars sported Real Rider tires. 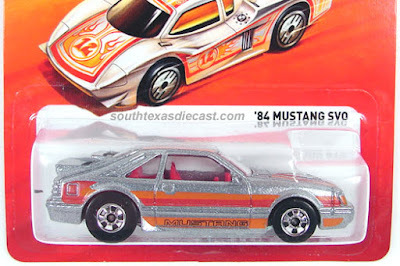 Here are the Mustangs that came out in this series. 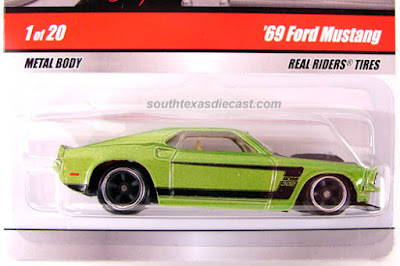 The Retro Entertainment Series came out in 2013 and has put out some awesome casting. 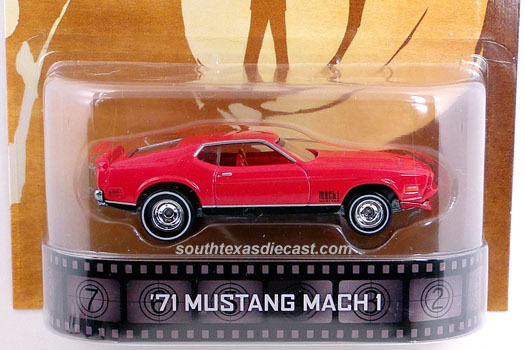 The series focuses on cars that has been in movies. There has been several very nice Mustangs included in this series as you can see. 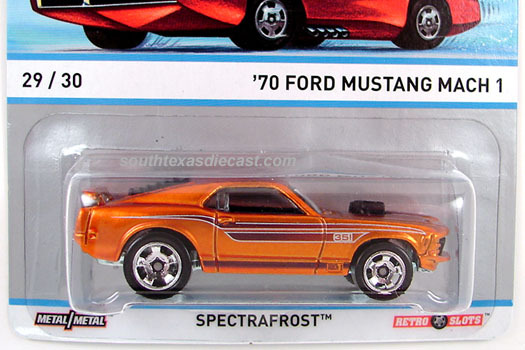 Both of these were part of the 2014 C case of the Retro Entertainment Series. 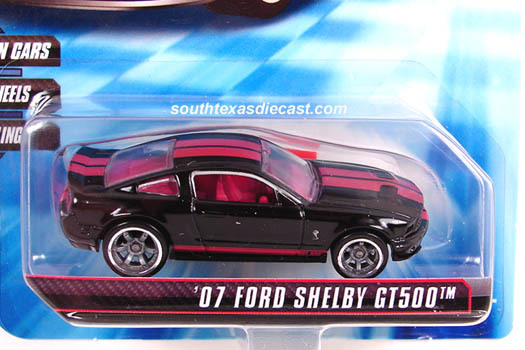 This one was found in the 2014 Retro Entertainment E Case. In 2011 Mattel put a series of cars out dedicated to some of the best racers of the racing world. 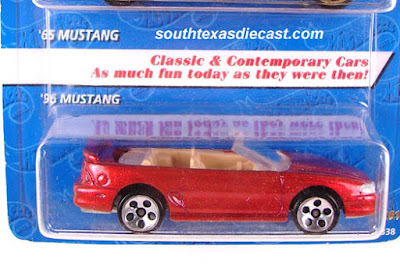 Here are the Mustangs that they put out in the series. 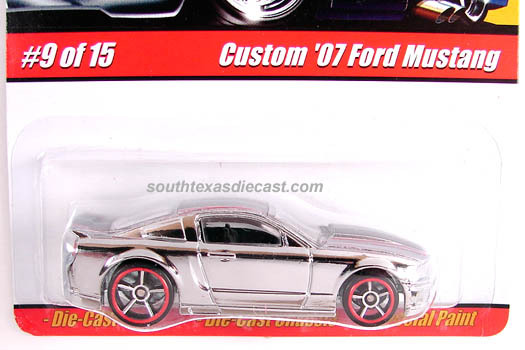 Could only be found in a 2008 4-car tin set. 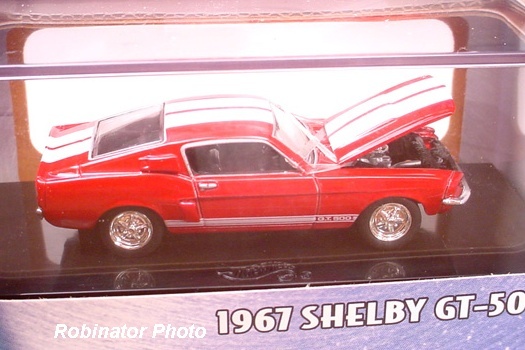 Featured a '67 Shelby GT-500 & '65 Shelby GT-350. 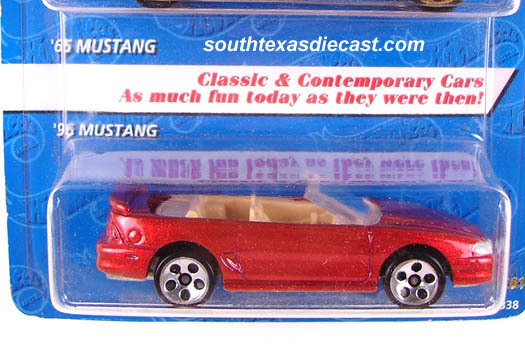 Featured a Mustang GT Concept (Hardtop & Convertible). 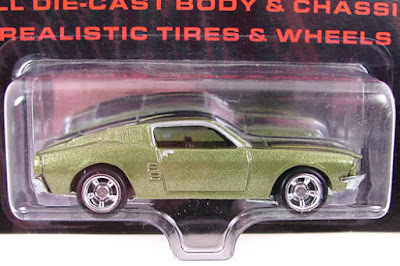 Part of the Muscle Car segment. These were all part of the Ford segment. These were part of the Rebel Rods segment. This Mustang was part of the Milestone Moments segment. 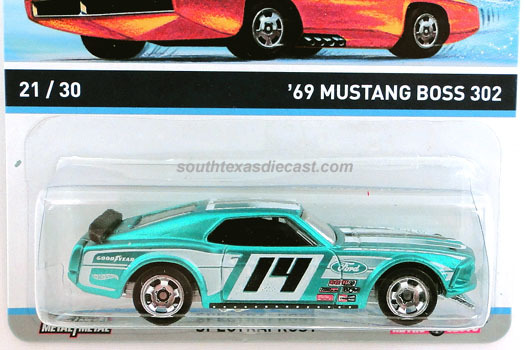 This 3 car set had these Mustangs it.